Boaz Myhill (4.7) and Huerelho Gomes (4.5) retain their spots in our squad thanks to a perfect balance of form, price and fixtures. We hand over the gloves to Gomes as Watford visits 16th position Bournemouth at the Vitality Stadium. Alternatives: Joe Hart (5.7) is an expensive but safe alternative as he is set to return for easy home fixtures against Newcastle and Bournemouth. Having opened the season with 5 straight clean sheets, Manchester City have conceded 6 goals in their last 2 games in the Premier League! City’s defense will be looking to end their (sky) blues with Joe Hart and Vincent Kompany possibly returning to the squad and we’re backing Kolarov (6.1) to get back into form with easy fixtures lined up at the Etihad. Eric Dier (5.1) scored a goal to follow-up his 3 consecutive clean sheets for Tottenham and restores our faith in Spurs’ defense. Aaron Cresswell (5.6) holds his spot in our squad as he faces Sunderland who have failed to score in their last two matches. Targett (4.0) and Cathcart (4.5) keep our bench warm yet again thanks to their low price which helps us bag some in-form midfielders this week. Alternatives: With 3 consecutive clean sheets and a goal last week, Craig Dawson (5.0) is a good budget alternative with relatively easy fixtures (CRY, SUN, NOR) ahead. Bacary Sagna (5.3) is a more affordable alternative to Kolarov who has only scored 3 points lesser than the Serbian and could offer more bang for the buck. Mata (8.8) has been in splendid form with 3 goals and 2 assists in the last 4 premier league games and another goal and assist in the mid-week champions league fixture against Wolfsburg. It’s not quite the Oktoberfest this year for the Red Devil’s as they’re set to face ARS, EVE and MCI this month but Mata’s play-making instincts and consistency should bag you some points through these fixtures. Riyad Mahrez (6.5) and Alexis Sanchez (11.1) have been retained in our squad this week. The Algerian international has gained a whopping 1 million pounds in value already and Leicester has a favorable set of fixtures lined-up: NOR, SOU, CRY, WBR, WAT, NEW. Sanchez has sprung into form and how! The Chilean scored a hat-trick against Leicester last week bagging 20 points and fought hard for the Gunners with a goal and assist in their Champions League loss against Olympiakos. P.S. The highest scorer for gameweek 7 (131pts) triple-captained Sanchez! Kudos Plesbol CF! Dimitri Payet (7.9) has been impressive for West Ham with 2 goals, 2 assists and 6 bonus points in the last 2 games and you can expect him to carry that form forward when West Ham travel to the Stadium of Light to face Sunderland who sits at the bottom of the table having conceded 16 goals already this season. Alternatives: If you’re looking to stock up on those City players for their easy lineup of fixtures, Kevin DeBryune (10.2) would be a great pick if you have the budget. The Belgian midfielder has had a promising start with 2 goals and 3 bonus points in his first 3 games for City. Callum Wilson’s injury last week has ruled him out for around 6 months which has already compelled 386,208 FPL managers to sell him off for another budget alternative. Leicester’s Jamie Vardy (6.5) fits right in having scored 5 goals and 1 assist in his last 5 games (340,784 have picked him). Diafra Sakho (6.7) picks up the third spot in our attack. The West Ham forward edged past other alternatives like Odion Ighalo (5.2) and Anthony Martial (8.4) owing to his form and easy opponents Sunderland. 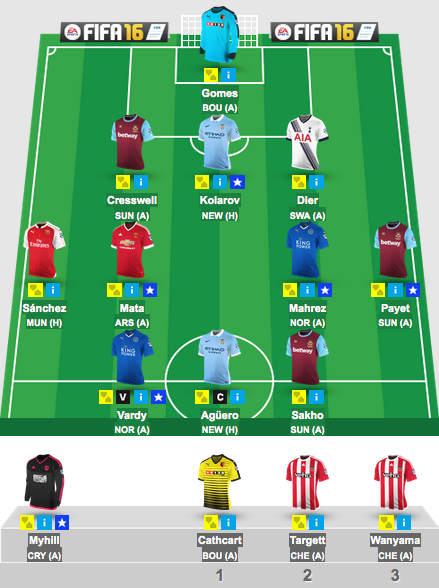 Alternatives: Daniel Sturridge (10.5m) could be a risky differential for you this week. The England international striker, as always, wasted no-time after he returned from injury recently and scored a brace last week against Aston Villa. His steep price and a line-up of moderately difficult fixtures (EVE, TOT, SOU, CHE) force us to leave him out of the squad for now.